There’s nothing fancy about this Simple Grilled Salmon. But who needs “fancy” when “delicious” fills the plate? I know there are more flavor-packed ways to grill salmon. The recipes for such are all over the internet and they look amazing. But do you know what is also delicious? Salmon thrown on the grill with no preparation or prior thought. I hesitated to try this because I’d heard salmon didn’t grill well straight on the grates. Lazy cook that I am (and by lazy, of course I mean clever), I decided one night to try grilling our salmon as-is. No prep. No seasoning. No cedar plank that had been soaked in newborn baby kisses (or whatever delightful options we read about that promise to present us with perfectly grilled salmon). Would it be good? Would my family eat it? Would it be a waste of good salmon? Or would it be yet another simple meal idea we could keep in our back pocket? You guys! Why must we make real food cooking difficult? Just go get you some salmon fillets and throw them on the grill. 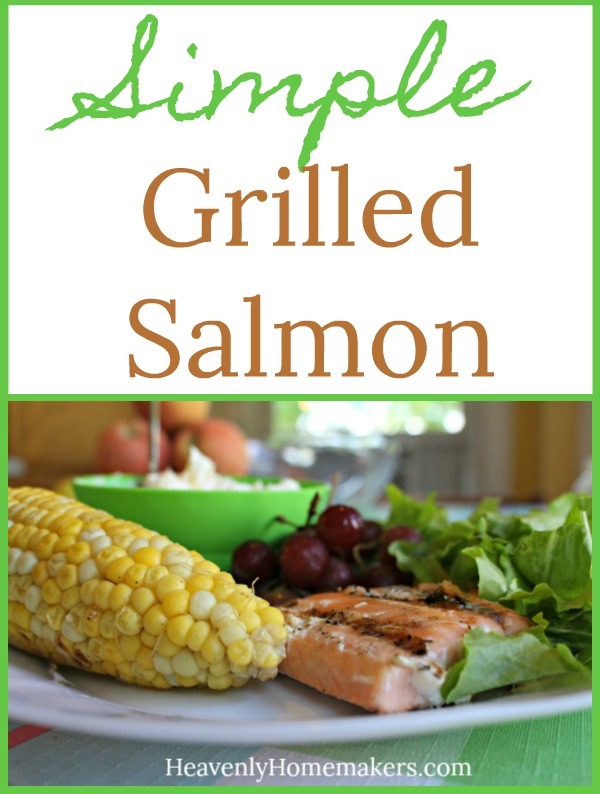 My family devoured this deliciously simple grilled salmon. My 13 year old ate three fillets before I could stop him. There were no leftovers and I will be making this all summer long. Might you want to squeeze a lemon over your grilled salmon? Absolutely. Should you consider making homemade tartar sauce (recipe below) to accompany this deliciously grilled meat? Certainly. Do we need to slave over and baby our salmon before we grill it? Not unless we want to. For the record, I don’t want to. Because I’m lazy. I mean clever. 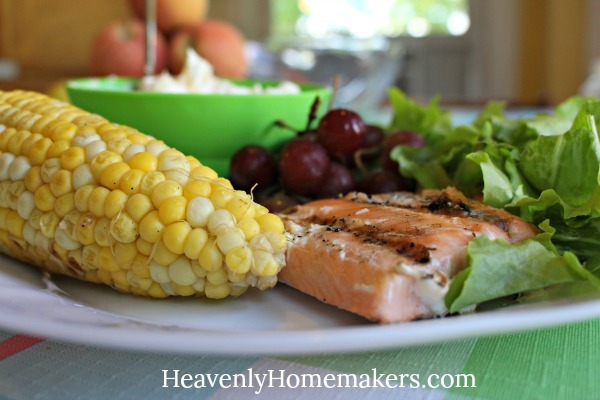 Serve this Simple Grilled Salmon with any fresh summer sides you have on hand: Fresh greens, corn on the cob, berries or other fruit, green beans or zucchini – what an amazing meal! Pineapple Fluff is a wonderful addition to this meal. When something is so easy it barely qualifies for a recipe, I can’t wait to try it! I want to eat good, healthy food, but I don’t want to spend tons of time prepping, cooking, or cleaning afterwards! Thanks for always sharing these. We’ve always used aluminum foil (I know some don’t like that) to lay our wild sockeye salmon filet on. Then we season with sodium free lemon pepper. It cooks in about 10 minutes, no turning. We just throw the foil away when done, no mess. When we grill salmon burgers from Costco, they go straight on the grill (ours is a charcoal grill) and I serve it with homemade dill aioli (mayo, garlic powder, and dill mixed up ahead of time and chilled), tomato slices, spinach leaves, bun – so so good!